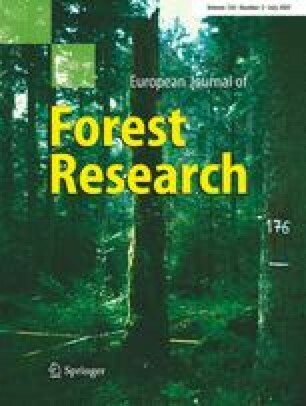 The diversity, spatial patterns and temporal dynamics of dead wood were examined within the near-natural beech forests (Fagus sylvatica) of Serrahn (North-eastern Germany). Data were collected in an 8 ha sample plot and in two permanent plots (0.36 and 0.25 ha) that had been established at the end of the 1960s. The mean volume of dead wood was 94 m3 ha−1, amounting to 14% of the total volume of all trees. The dead wood displayed a large variation in dead wood type, tree size and decay class. Standing dead wood accounted for about one-third of the total dead wood volume. The densities of standing dead trees were about 10% of the densities of the living trees over a wide range of diameters. The overall spatial distribution of dead trees exhibited a random pattern. Among the different dead wood types, standing entire dead trees and uprooted trees deviated from this pattern by displaying a significantly aggregated pattern. In the permanent plots a high mortality of overstorey trees was observed (1.3% year−1) and the average amount of dead wood increased greatly from 2.9 to 111.6 m3 ha−1 over the 35-year observation period. The near-natural beech forests of Serrahn have experienced a long period of low human interference. Nevertheless, our results suggest that the structure and dynamics of dead wood are strongly affected by the last major disturbance events that took place at the end of the Middle Ages. Information about the forest history is therefore a basic requirement when interpreting the results obtained in near-natural forests. We thank the Müritz National Park Administration for collaboration and the permission to conduct this study in the Serrahn beech forests. We are also grateful to Jan Habel, Britta Marquardt and Maren Mönnich for assistance in the field, and to two anonymous reviewers for their helpful comments on an earlier version of the manuscript. This research was funded by the German Federal Ministry of Education and Research (Research Focus: “Future-Orientated Silviculture”, contract no. 0339756).